Daughter of a famous screenwriter father and steeped in the world of theatre by her actress mother, Liza Pulman was always going to have a strong creative streak. 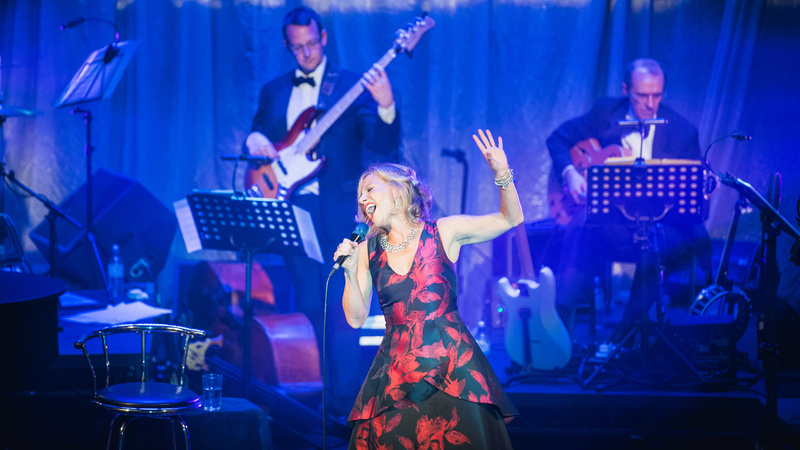 Having spent her early career singing at Glyndebourne, appearing in the West End and starring for 14 years in the comedy music trio Fascinating Aida, she has been garnering 5* reviews and entertaining audiences up and down the country with her new solo show LIZA PULMAN SINGS STREISAND. Joined on stage by MD Joseph Atkins and her 6-piece band, Liza’s new show celebrates the songs of the great Barbra Streisand and illustrates her prowess as not just as an extraordinarily gifted singer but as a comedienne and entertainer. What prompted you to launch your latest solo tour, Liza Pulman Sings Streisand. I’ve always adored doing solo work and have grown to love it more and more as I’ve grown older. A couple of years ago, one of my Fascinating Aida colleagues needed some time off to recover from an illness, and this break seemed like the perfect opportunity to develop my own show. I formed my amazing 6-piece band and we hit the road together with our first show Songs of Hollywood. One of the songs I sang in that was Evergreen from the film A Star Is Born, and so many people told me I sounded like Barbra Streisand that I started to look at how and why that might be. I realized that she has been such a huge influence on my singing and on my approach to music that I wanted to celebrate that somehow. Well, I pay tribute to her but it’s by no means a tribute show. I don’t do an impersonation of her or put on a curly wig at any point! But, for me, it’s a chance to celebrate this extraordinary woman by singing just a handful of some of the songs that she’s made famous throughout her long and glorious career. That was a far harder task than I had originally thought. She has been performing and recording for nearly 6 decades and choosing the songs that would go into my show was a real Sophie’s choice. In a 90-minute show there just isn’t time to sing everything, but In the end I hope that it’s a fine balance between the hits and a clutch of some of those fabulous songs from her back catalogue through which I am then able to weave a narrative. Frankly I would be lynched if I didn’t sing the likes of Evergreen, The Way We Were and People. The arrangements and orchestrations are very different, who did them? It’s something we’ve striven to do to make our interpretation of these songs unique to us and I work very closely with my brilliant musical director Joseph Atkins. The ideas tend to start with me at my piano at home and then Joe and I will spend hours making them work together, going over every small detail, sometimes spending 40 mins on one bar of music! Then Joe goes off and orchestrates them and brings our ideas to life making our 6 piece band sound like the London Philharmonic!! Do you enjoy putting together the programme for your shows? I absolutely love putting the show programmes together. I love creating new arrangements of songs that people know really well and also introducing the audience to songs they might not already know. Then taking all of these songs and shaping them into a great night. Light and shade. Fast and slow. Big and small. There’s a natural flow to these things and it’s a fabulous challenge to find it. Actually, I love it!! I miss the Fascinating Aida girls of course – there’s’ a wonderful safety net with the three of us on stage together- but in my Streisand show I am backed by six amazing musicians and we are a proper family. When we first started with the Hollywood show last year, I was much more out front, and they were more of a backing band, but these days I ask our stage manager to put us as close to each other on stage as he dare. One of the great joys of the show is the relationship I have with these fantastic players and the audience loves to see that. How would you describe your relationship with the audience? I’ve done all sorts of performing throughout my career, but It’s taken me to be nearly 50 (she coughs…!) to realise that the thing I love most in the world is to stand on a stage and just sing, talk and be myself. I love people and I am at my most relaxed when I am up there. Obviously, I write and script my shows and there is a shape and a structure to them, but the best bits are always the improvised moments when something goes wrong or when someone in the audience says or does something unexpected. On a long tour, no matter how tired I am, hearing the audience’s laughter or for that matter, their silence is the biggest lift of all. Tell us about your path to becoming a singer? I always sang as a kid. My mum and my sister and I would sing close-harmony on long car journeys and my sister and I sang together for years as “The Pulman Sisters”, singing music from the 20’s, 30’s and 40’s. We started out just singing at our parent’s parties but ended up singing in the foyers of the National Theatre and the Royal Festival Hall. We were good. We made a great sound, like only siblings can. Then I went to The Guildhall School of Music and Drama where I studied singing for six long years, before joining Glyndebourne where I spent several years as a junior principle. It was a pretty amazing start. With my mother, the actress Barbara Young, (Coronation Street, Last of the Summer Wine) and my father, the screen-writer Jack Pulman (I Claudius, War & Peace), I was surrounded by writers, actors, directors from a very early age, in fact, I don’t really remember anything else. There was a brief period where I fancied being a vet (not long after my goldfish, Felicity Fruit-Cake, died from unnatural causes) but the performing gene was always going to get me in the end. How do you look after your health on tour? At home I do Hot Yoga and I also love to walk but it’s impossible to keep that up on a tour. I do miss those long walks desperately but I’m never in one place long enough, and I tend to stay in un-glamorous motels by motorways, which aren’t particularly conducive. I put the kettle on and try and stretch a bit but it’s not quite the same! I’m a real fruit bat and I always carry a piece of root ginger with me to make hot ginger and honey. It’s a life saver when your voice is a little tired. I am incredibly lucky as I live in Cornwall and I look at the water every day of my life. I don’t really need to go anywhere other than my own front room to get away from stuff. As I said, I do love to walk, and I will often put my walking shoes on and just go, either chatting with friends and family on the phone as I walk, working on my shows, or just listening to the birds in the trees and the waves hitting the shore. I do some of my best work like that. What took you to Cornwall? Love!! My partner (who is now my husband!) has lived there for some years and I fell in love with him and it! We got married last summer in a marquee overlooking the water. We had good food, good friends and good music! The Syd Lawrence Orchestra played for us on the headland surrounded by bales of hay and then we danced the night away to The Counterfeit Stones. The whole thing was utterly surreal and totally joyous. In 2005 you found yourself caught up in the terrible tragedy of the 7/7 London bombings. People may have read the article you wrote about it for the Guardian or seen your mobile phone footage. How does it feel now when you look back on that part of your life? It was a life-changing experience that’s for sure. I was on the Piccadilly line train in which 26 people lost their lives. It’s hard to fathom how you can have been so close to death and yet walk away relatively unharmed. We were down there for about 20 mins and as we were finally led to safety I took a few photos as I had a new phone and it was one of the first phones with a video camera on it. The tunnel was dark and filled with smoke and my photos weren’t coming out very well, so I thought I’d try the video instead. I’m only 5’2” so I just held it above my head and pointed. It was incredibly difficult walking along the underground tracks, so I had to stop after about 45 seconds and focus on my feet, but when I finally managed to get home I showed it to my husband and he sent it into Channel 4 news. In less than 10 mins it was all over the world. It was an extraordinary moment. Nowadays, people don’t think twice about using their phones to video what they’re seeing but back then it was a completely new thing. I guess I was a kind of pioneer! In the days that followed I wrote the article to explain how wonderful people had been, how kind and funny and caring they had been in the worst of all possible situations. It was humanity at its best and it was humbling to be in the middle of it. Being on the Piccadilly line train that day changed everything for me and I realize now all these years later quite how long it has taken me to really deal with it. I still jump when I hear a bang, a bus horn or the pop of a champagne cork but I think that I probably hold onto life just a little more tightly these days. Who has been the most important influence on your musical life? I’m not sure there’s been only one musical influence on me. There’s a bag of them. Sinatra, Garland, Mabel Mercer, Al Jolson, Barbra Cook, Barbra Streisand. I love the old blues singers too -Ethel Waters, Billie Holliday, Sophie Tucker. I’d like to have been a blues singer in the 20’s and 30’s I think. All that suffering and song! If it could be anyone in the world, who would you most like to duet with? Living?? That’s tricky for me. I only really like the dead ones!! Actually, not true. There are some amazing singers out there at the moment. In terms of the kind of music I love to sing I think you still can’t beat a bit of Harry Connick Jr. He’s an amazing musician, produces great band arrangements, wonderful piano playing and a voice that kind of makes you swoon. He’s old school! I’m also completely in love with a German singer called Max Raabe and if he asked me to sing with him and his Palast Orchestra I would jump at the chance!! What are your desert island discs and your one luxury item? I find the desert island question tough as there is so much wonderful music out there. My listening tastes are incredibly eclectic, and I would probably have to include something by Sinatra, Elvis, Jolson, Billie Holliday, Streisand, Chet Baker, Leonard Cohen, Randy Newman, Joe Pass, Oscar Peterson, Fats Waller, The Beatles…. the list is endless. As for a luxury item, I’m afraid that would have to be my cat, Mr Chips. 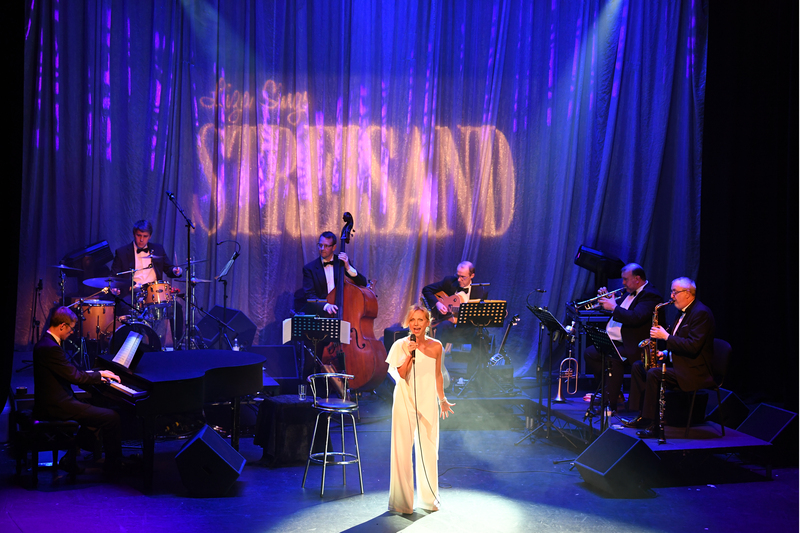 Liza Pulman Sings Streisand, coming to Blackpool’s Grand Theatre on Saturday 9 November. Tickets are available at our Box Office on 01253 290190 or click here.